So. You know I've been on a nail kick lately (see Kiss My Nails) and you know how I love Texas. Well, imagine my excitement when I learned that the big momma of nail polishes with coocoo bananas names like Green-wich Village and Pink Before You Leap, has a line inspired by Texas. How cool is that? Of all the states to choose from, OPI picked the Lone Star State first because... duh! Texas rocks! Here's the deal-- as much as I like the colors and the new jelly finish, I think OPI missed the mark on this one. It just doesn't scream Texas (and it should because everything's bigger in Texas). The jellies make me think of tropical fruit drinks and the neutrals and turquois remind me of Santa Fe. I have no idea what purple has to do with Houston or what Guy Meets Gal-veston means. In fact, I'm not sure what most of the colors have to do with Texas. 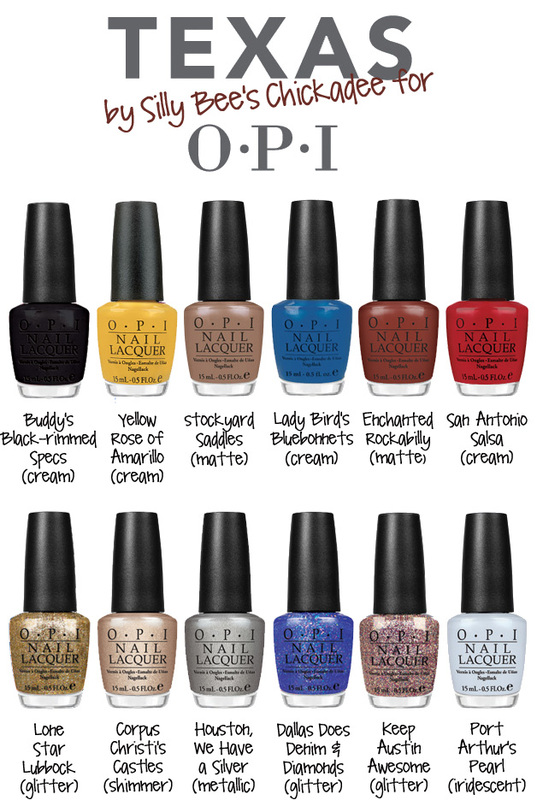 Now, I understand that OPI probably wanted to get a jump on the jelly finish before anyone else, but with a little research they easily could have snuck them in with Texas-inspired names. Take Big Hair, Big Nails-- it looks just like a Ruby Red grapefruit which is a big deal in Texas. So is the Strawberry Festival in Poteet and that bright orange could reflect the Mission valley where the Texas Citrus Fiesta Queen reigns. Who's Buddy? Castles in Corpus? What's Port Arthur's Pearl all about? Look it up and learn a bit about Texas! 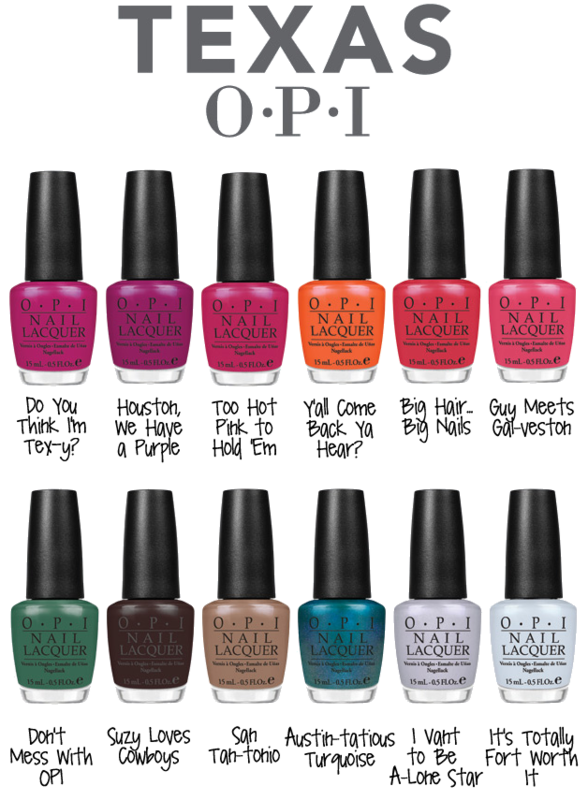 What would your state's OPI collection look like? Neutrals and mattes, or brights and glitters? What's more important when designing a collection, coordinating colors or a cohesive theme? I'd love to hear your take on your beloved state or country! Of course I gave in and decided it was my duty to help put Texas on the nail polish map. So, I bought the five shades named after cities. 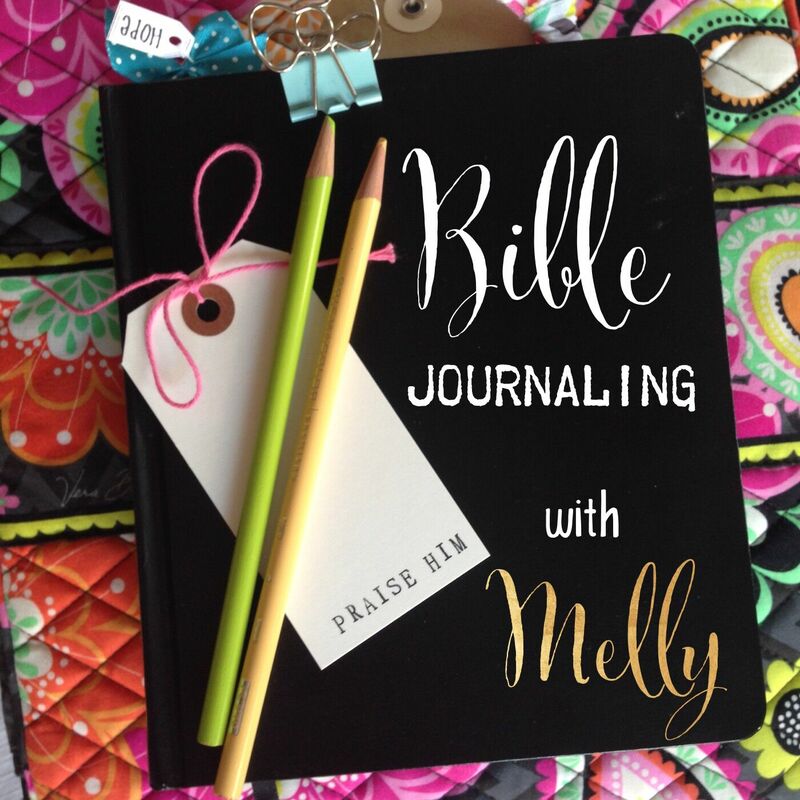 Slowly, one bottle at a time with coupons!